Beach Getaway! Steps To The Sand & Venice Pier! Free Parking! 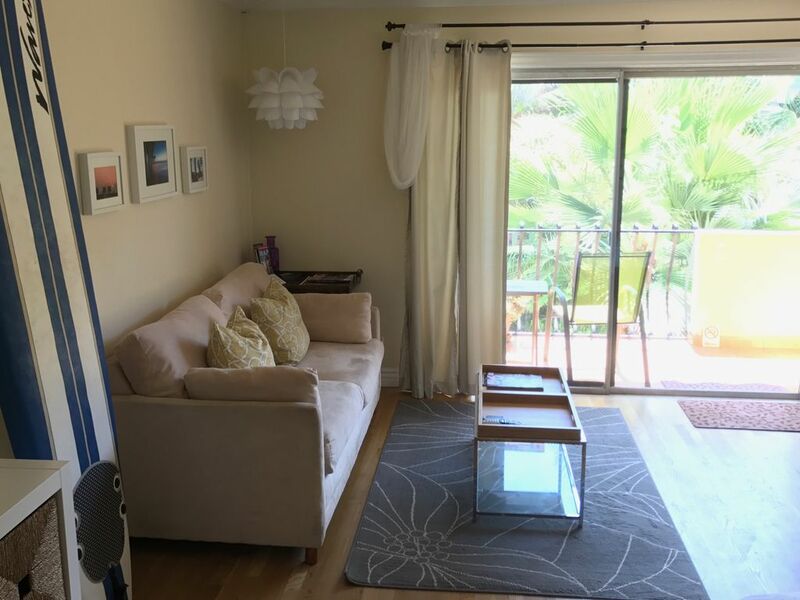 Bright beautiful studio situated in the coveted Marina Peninsula on a vibrant walk street. Private balcony with a peekaboo ocean view. Just steps to the beach & 3 blocks to great restaurants, nightlife and the Venice Boardwalk. Visiting in 7 days or less? Ask about our last minute booking specials! Welcome to your Southern California beach vacation! Live like a local in our inviting studio apartment in the energetic Venice Beach area. The studio is located on a lively, beautiful walk street where you will be 7 houses away from the beach. Once you're on the sand, you’ll find a gorgeous stretch of beach where you can catch some waves, play beach volleyball, cast your fishing line in the surf or off the pier, or relax and enjoy the breathtaking views and the Pacific Ocean. Grab our beach cruisers and head down the bike path to the Santa Monica Pier, take a trip around the Marina del Rey harbor, head to hip Abbott Kinney Boulevard, or the enchanting Venice Canals – all are just steps away. A short 3 block walk brings you to Washington Boulevard where you’ll find great restaurants and coffee shops, fabulous nightlife, local shops and the Venice Pier. The famous Venice Boardwalk is a short walk down the beach path. The Venice Boardwalk is a great place to people watch, find amazing local art, watch street performers, check out Muscle Beach, browse through eclectic shops, and enjoy a multitude of restaurants and bars. Marina Del Rey Harbor has kayaks and stand up paddle boards available for rent, as well as harbor tours and a water taxi. Boat and jet ski rentals are also available. The studio has a flat screen TV with Spectrum cable access and pay-per-view movies, high speed wireless internet, air conditioning and a balcony overlooking the walk street with a peekaboo ocean view. We have a well-stocked kitchenette, full bath, and offer bikes, a surfboard, boogie boards and beach chairs for your enjoyment. A secured parking space is also included during your stay. The kitchenette includes a small refrigerator, freezer, microwave, Keurig coffeemaker (stocked with complimentary coffee), a toaster oven, hot plate, and all plates, glasses and utensils needed. We provide a welcome basket with wines, snacks and bottled water. The studio is furnished with a comfortable pillow-top queen mattress and a iPod/MP3 player/clock radio that fills the studio with sound. The living room area is bright and comfy with a view of the balcony and walk street. The sofa pulls out into a full size bed, and the dining table with seating for 4 is located in the main living area as well. The studio balcony has a peekaboo ocean view, a gas barbeque and a view of the shared patio, and of the walk street. It's a great place to enjoy the ocean breezes and view while relaxing with a glass of wine. Our shared patio offers a lovely dining/meeting space and a charcoal barbeque for your use. We provide all linens and towels, including beach towels. There are coin-operated laundry facilities on site. I was born in the LA area but spent most of my life in Washington State. I moved back to LA about 7 years ago and have never been happier! I love the diversity of LA and all it has to offer. Hiking the Santa Monica Mountains in the early morning, kayaking in the Marina in the afternoon, playing volleyball on the beach with friends or skateboarding down the strand, then heading downtown to a museum or unique event in the evening. What a life! I fell in love with the Marina Peninsula shortly after I returned to SoCal and I’m so happy to live here. I live on the premises and take great pride in this property. It's my pleasure to share the beauty of this area with my guests. I hope you fall in love with it like I have! One parking space provided for guests. Underground, secure parking.. No extra fee. Salt, pepper, cooking oil, sugar, paper towels and other basic pantry items provided. Private balcony with peek-a-boo ocean view, view of walk street. Property as described. Well situated. Sunny balcony has sea view. Responsive but respectful manager. Just what I needed for a relaxing beach based retreat but wth restaurants and Venice attractions such as the canals within easy walking distance. Studio was in a great location, clean and walking distance to local attractions and places to eat. We came for a winter getaway and this place did not disappoint. Shandi was helpful and fast with communication. It was great staying so close to the beach and the Venice broad walk. And the restaurants close by were delicious. My family can’t wait to come back. Very nice and convenient for walking! Fun place for Girls weekend! Great location! Perfect for our girls weekend. Would highly recommend. Nice place and a great location. Nice quaint little condo that's just a very short walk to the beach, and on the quiet side of town. The studio is located in an active beach community. Our neighbors enjoy the inviting southern California climate, the beach, and our lovely patios. Our walk street is filled with locals and activity. It's a great place to be! Do you want a laidback, low-key vacation? This is the place. Relax on the beach, enjoy the Venice Canals, or lounge on your private balcony or our shared patio. Do you want adventure and activity? Surfing, boogie boarding, volleyball, hiking, kayaking, stand up paddle boarding, biking and more all await you here. Do you want to experience great restaurants, nightlife, and people watching? Washington Blvd and Venice Beach offer it all. LAX is only 10-15 minute taxi ride away. There's LA public transportation 3 blocks away on Washington Boulevard. We have 2 beach cruisers available for biking around the area. And during the summer, there's a free beach shuttle that travels around the Marina and to Santa Monica. Free street parking is available in the area and there is a pay parking lot nearby.